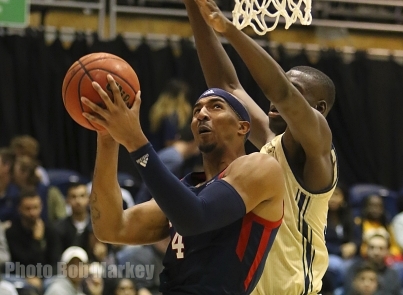 Three days after losing to FIU, the Florida Atlantic University men’s basketball team earned its revenge with an 89-72 win over the Panthers on Saturday night. The victory snapped a four-game losing streak and improved the Owls’ record to 12-9 overall and 3-5 in Conference USA. The Panthers (13-8, 4-4) started fast, taking a quick 8-2 lead at the 16:34 mark. FAU scored seven straight points to take a 9-8 edge. The two teams exchanged momentum for the next several minutes before FIU went on a 7-0 run of its own to stretch its lead to 27-17. The Owls clawed their way back and after a Kevaughn Ellis block led to an Anthony Adger three that just beat the horn, held a 43-42 lead at the break. That momentum carried over to the second half, when FAU opened on an 18-3 spurt to stretch its margin to 16, 61-45. FIU was able to narrow the deficit to five, 71-66, but the Owls scored 17 of the game’s next 19 points to foil any hopes of a Panther comeback. The announced crowd of 4,710 was the largest seen by FIU for a home game in four years. The Owls will next return to the Burrow for Brew Night and Military Appreciation Night on Thursday, Jan. 31 when they play host Louisiana Tech at 7:00 PM.